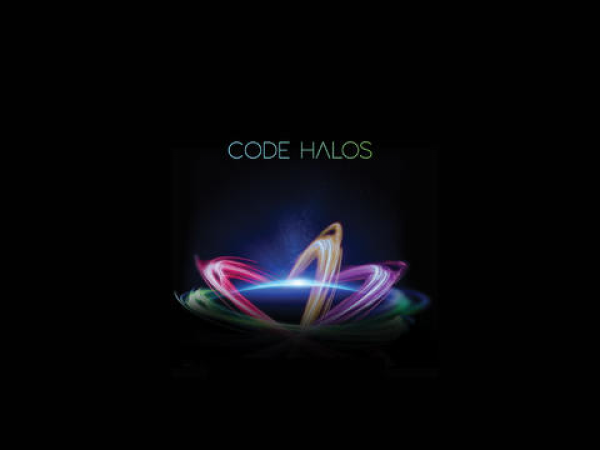 Code Halo™ – the information that surrounds people, organizations, and devices – are today's digital fuel. 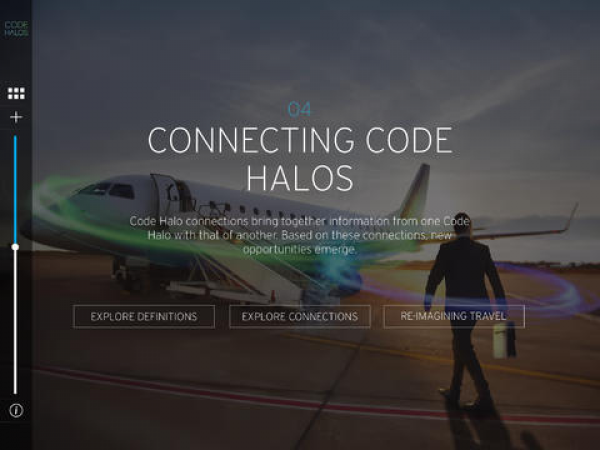 Learn how they catalyze performance by downloading our new "Code Halos" app. We were briefed to bring the Code Halos story to life. It was a complex project, and we needed to provide a visual language to communicate what Code Halos are and why they’re important. The imagery we chose had to be stunning, to accompany the narrative. Ultimately we needed to get across as much of the information contained within the book, in a much smaller space for the app. We used video, audio, animations, images and text to achieve this and made the app as interactive as possible to tell the story. It’s totally different to anything else in its category of business management thought leadership. This app presents an interactive, unique way of telling the story distilled from the wisdom contained in the hard back book. The app leads you into the content, which is neatly arranged into sections. 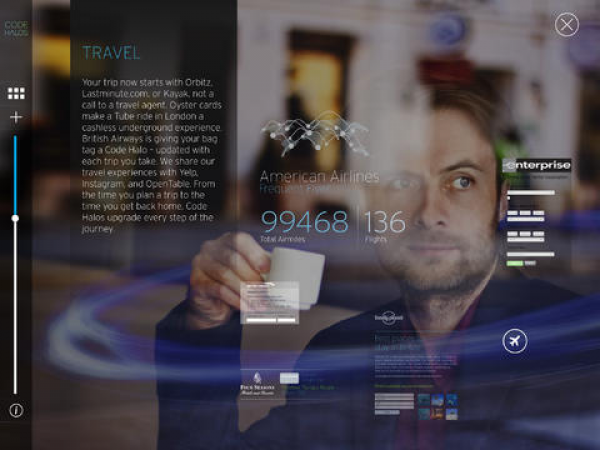 The user is free to jump around the app, using the main menu, or use the left hand navigational slider to move sequentially through the content. The project team likened the experience to navigating through IKEA where there is a preferred route, but the option to skip sections of the store if they want to. The Code Halos iPad app was produced as a companion to the more traditional printed book of the same title, Code Halos, How the Digital Lives of People, Things, and Organizations are Changing the Rules of Business. The idea behind the app was to provide a media rich experience for those who wanted to explore the book concepts on their tablet. 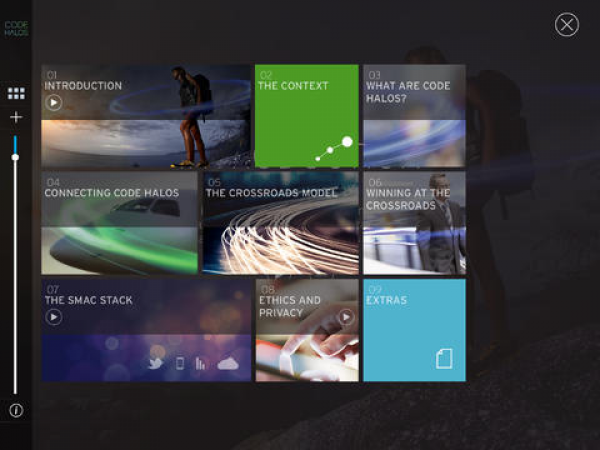 Incorporating video, audio, and animation, the app tells the Code Halos story in an interactive way to engage users. Users of the app can follow a recommended path through the story, or jump around if they’re interested in specific topics, and multiple navigation options are provided.